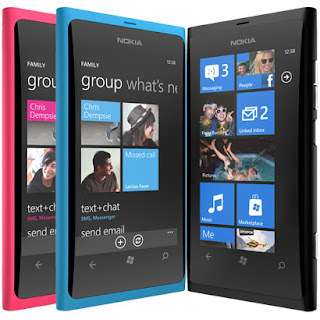 Nokia provided us with a brand new Nokia Lumia and here we have a details unbiased hands-on extensive review of the same. 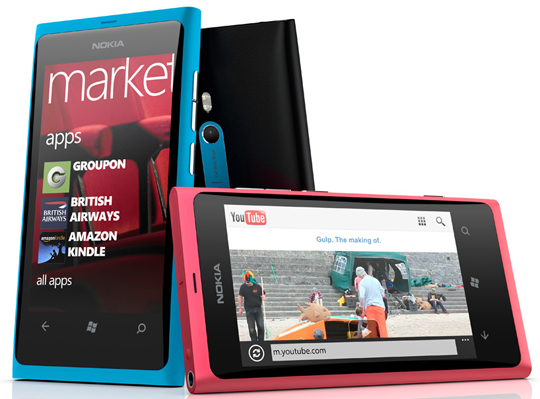 Nokia Lumia 800 is surely here to take the market away. The first look of Nokia Lumia 800 will make you think the futuristic movies we see with hi tech Technology stuff. The screen of the phone will surely make you go crazy with its thick looking glass with curved edges. The User Interface of this windows phone is commendable with clean sweep, sharp animations and amazing tiles view. It is much different than conventional iOS, Android or Symbian UI. The social networking apps integration has come up excellently. Let us check out what this amazing new phone is offering us. Nokia has come up with Windows OS having latest Mango update. The Windows phone software supports number of features and we can access them simultaneously, thus it handles multi-tasking. 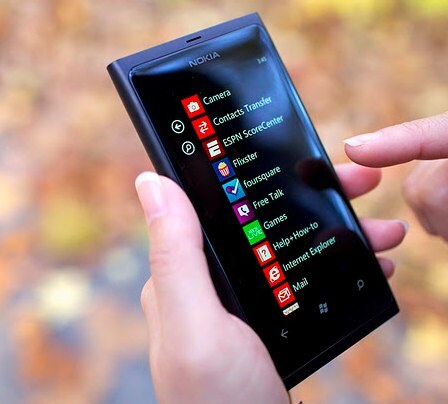 It was a good idea that Nokia has discarded its Symbian phone and has come up with Windows because the brand new interface is too impressive to even make us think of Symbian again. Windows Phone looks are extremely stunning and the credit goes to the crisp 3D effects and the curvy all black design , it feels more fresh than any of latest OS like of Android or iOS. The home screen UI is completely innovative and totally different from regular phone OS’. It displays tiles for different applications. The Contacts/People tile changes the pictures of your contacts at random and the pictures are drawn from you social network account, while messaging and mail tiles shows the number of unread items with funny changing smiley if unread item count exceeds four. You can even choose your own applications to be pinned on home screen. Looking to the right you can see an arrow which gets you to main list of apps in phone. Searching a particular app is really easy from a list as windows phone arranges them alphabetically and you can quickly jump to apps of your choice. Opening and Exiting an app is a fun to look at as the 3D flip effects give an impression that icons are enjoying being on your phone. Switching between multiple running apps have never been this easier you just have to press the back button for two seconds or so and a deck of cards shows up displaying a thumbnail of the currently running apps. You just have scroll to look for it click on the one you want to use. There are some drawbacks. Firstly, it does not support Google maps but have Bing maps which are inaccurate to a certain extent. Secondly, the copy paste option is too confusing and the tabs for selecting text are on smaller side. Thirdly, it does not support flash player so you cannot play videos or play games for most of the sites. It will be too difficult to take your eyes off the new Nokia Lumia 800. It seems a single body with no changing of battery slot made entirely from polycarbonate with slightly curved edges and is available in three colors: black, cyan, magenta. Even though it has plastic body but still the phone handsomely retains its executive and rich look. Besides, Nokia says that the plastic casing helps the handset's phone reception. The front of the phone is completely covered by herculean gorilla glass and three contemporary windows phone touch buttons at the bottom. The only physical buttons are on the right side, a volume rocker, a camera button and a lock button. The camera button solves it purpose too correctly in all the Nokia handsets , you must have to press the camera button to open camera even on phone’s Standby mode. Nokia has a micro USB port which is used for both charging and syncing , a 3.5mm headphone jack, a micro SIM slot on the top hidden beneath a sliding cover. The phone is big enough to be fitted perfectly in hand and the curved edges help in keeping a smooth grip for the phone. It is a completely closed device, so you cannot remove the battery or insert a microSD card as there is no slot for it. Nokia has devised the phone on 1.4GHz Qualcomm MSM8255 Snapdragon processor, which includes an Adreno 205 GPU. The OS has 512MB of RAM and 512MB of ROM. There's 16GB of internal memory for storing music, videos, photos and apps. Call quality has no loopholes, the earpiece convey clear audio and loud enough to be clearly understood even in noisy places like busy streets or while transporting. Mic has an impressive speech quality and phone’s reception is good enough to remain connected even in weaker signal aeras. The battery life is not something exceptional, it is same as one can think of any smart phone, you have to charge it once in a day depending on your usage. 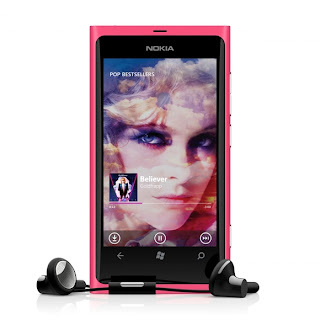 Nokia Lumia 800 has an elegant 3.7 inch screen with a resolution of 480x800 pixels which implies 252 pixels per inch . The display uses famous AMOLED technology which is nowadays very important for High end smart phones like Galaxy S2. AMOLED is preferred over other technologies because of its self illuminating properties which results in pulling up of less power by darker colors. The dark levels produced by it are so intense that it is difficult to tell where the screen has its borders in the standby mode. Lumia’s screen has impeccable brightness levels giving the colors a vibrant crisp look. One thing you must know after looking at the white pages of internet on Lumia 800, I realized white was never this whiter; even Samsung S2 has a tint of blue to its screen. 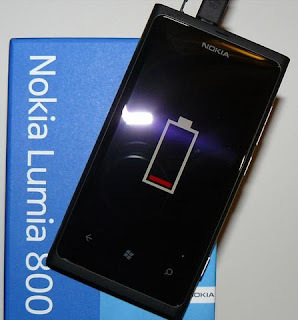 It was expected Nokia Lumia 800 to be different from other Windows phone because of its apps, but Nokia didn’t yet customize its maps with the OS. On the other hand we have Nokia Drive in the phone. It tells us turn by turn navigation with voice prompts. You can also download the maps in your phone so that you can use them whenever you want to switch of your phone internet or you are in roaming. Packs of languages are also available to download and maps can be viewed in 2D and 3D. Another great looking app is the Nokia music app , it has some of the functionally of the ZUNE software which helps in transferring songs , pictures , videos etc to the phone. It also has a phone music store from where you can buy songs for 99p each. It also has some features to make you aware of gigs that might be happening at a place near you, it will provide you the details of venue and time of the event. It also has a Mix Radio station on which you can stream for hours and listen to your favorite songs without any mandatory subscription. Radio Mix is as easy to use as listening to it and have innumerable tracks to choose from. You can select your genre of interest and list will be displayed according to your choice including best sellers, new releases, classics etc. Once you select track of your choice, it will start streaming, if you like the track you can even buy it from the music store. Radio Mix service works over your Wi-Fi and 3G connection as well by which you can enjoy live streaming. Nokia is also looking forward to launch an update to cache the tracks so that they could be listened to even in offline mode. Plus a feature to pin your playlist on the home screen is also yet to come. Another great feature that Nokia has added is App Highlights, it offers recommended apps to be downloaded from Marketplace and also alerts you for any updates of Nokia’s own apps. Speaking about the windows phone Marketplace, it is lacking in number of applications in comparison to apple store or Android Market but it has all the essential apps one requires on his phone. But now the Market place is expanding as more and more contributors are joining. Already apps like Pulse and Weave, Tesco Groceries, Groupon, Amazon Kindle, Kayak and Tripit have made their way into the market. The OS has built in support for Facebook, Twitter, Facebook chat and LinkedIn and even the Microsoft Office for editing documents is already present. One thing lacking in this high end phone is front facing camera which we have expected to be on a phone of this price range, so features of video calling etc cannot be used. 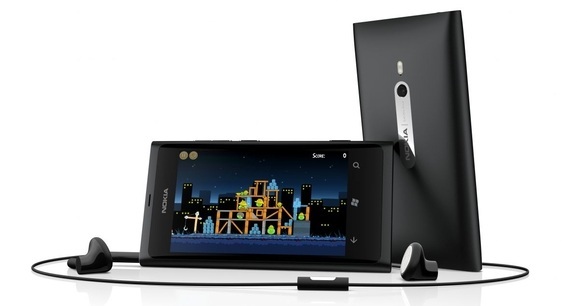 Nokia is always known better for its cameras, It has done an equally good Job with Lumia 800;s camera. It has Carl Zeius Tessar optics lens and 8 megapixel sensor which take excellent shots. Camera is slow when focusing and sometimes cannot take the right focus. Lumia has an awesome UI, best design for a smartphone till date and nice features. However, there are few issues / bugs / usability flaws I found and thought to highlight it. Please note that most of them are Windows Phone OS specific and can be fixed with just one update. 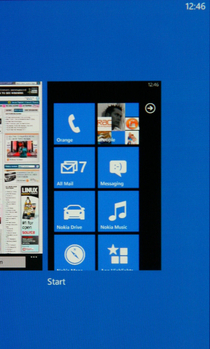 Windows Phone OS is a new mobile OS and we should give them time to iron out all the issues. When the phone is discharged completely, the battery is totally drained off, to the level that even if you plug in the adapter it doesn't have power to detect a charging and it lies dead. Many people reported the same and it has now been fixed. No SD Card Slot - No expandable Memory option. Common Volume setting for Ringtone and Songs, i.e. if you want to listen to song at low sound, your ringtone sound will also be decreased. A vibration, followed by ringing, both events will not happen simultaneously! Cannot delete or mark multiple contacts from phone or Windows Live ID. Market place has less apps. Bluetooth Connectivity Issue - File Transfer not supported. The phone will not work as Mass Storage Device when connected to System. The loudspeaker is quite inaudible in noisy places. The Reset phone option is in About Section of the phone. WHY ? Everything to be synced by Zune Software, you cannot directly add anything. Can’t make folders to arrange files. All the installed applications appear as list which keeps on growing and becomes difficult to search or manage them. Can’t Send/Receive a Business card. How can Nokia miss it? No option of Edit and call. E.g. I receive an SMS of a person as “Andrews – 98XXXXXX00” with “– 98XXXXXX00” highlighted link. When I click it and try to call it dials “– 98XXXXXX00” (with the ’-’ hyphen) and calls it as wrong number. Can’t save a radio station with name. Can’t change the music station through headset. It just Pauses and Plays the music. If you want to change the radio station you need to get the phone out of your pocket and do it. The camera quality is good for close-ups but long distance shot gets bit blurred. Don't get all worried, by the time you read this, Windows Phone OS would have pushed an update to solve these issues. The Lumia 800 has bring the concept of Windows phone beautifully to us and has an amazing social networking integration with it. The looks of the phone are breathtaking enough to admire it. Camera might not be up to its expectations but the picture quality is enough clear to make us forget all its flaws.